There is an old saying that was mentioned many years ago by British author Kazuo Ishiguro which stated that in order to be successful, one has to work within his own boundaries and with the resources that he has at his disposal. Some of the themes used in his novels- the most popular was of course “The Remains of the Day” (published in 1989)- have something to do with trying to go beyond one’s own limits only to meet failure and later regret some years later and eventually, these self-made tragedies are usually served as a lesson for future generations and those who have yet to experience life and know that there are limits to what one is doing. I wish I can say the same for the governmental agencies and their dealings with historic bridges, for up to now, whenever a historic bridge that has a unique appearance which people can relate to is considered obsolete, they would successfully find ways to destroy them in favor of modernized structures with a very bland feature. We have already seen the demise of the Bridgeport and Fort Steuben Bridges in the Wheeling (West Virginia) area within the last nine months. The Minneapolis and St. Louis Railroad Bridge over the Minnesota River in the village of Carver, located southwest of Chaska, was removed upon orders of the Union Pacific Railroad in October 2011 despite pleas from the villagers and those interested in preserving a bridge. And perhaps the latest act of stupidity among the agency is replacing the Dolles Mill Bridge in Bollinger County (Missouri) with a concrete slab bridge that is narrower than the Parker through truss bridge built in 1913. So it definitely came to a surprise that the Ambridge-Woodlawn Bridge, located over the Ohio River near Ambridge would actually be spared demolition despite being 85 years old and quite a narrow bridge fitting today’s standards. Built in 1927 by the American Bridge Company, the bridge is located in Beaver County, approximately 80 kilometers south-southwest of Pittsburgh, but still deep in the territory of western Pennsylvania. Up to now, the Pennsylvania Department of Transportation played a role of the wrecking ball in influencing decisions to demolish these bridges, destroying as much as 60% of its bridges within the past decade. This included the Foxburg, West Hickory, Venango and East Brady Bridges. Yet despite its bad track record, plus further plans to replace more historic bridges in and around the Pittsburgh area this year, there seems to be a change of heart, or so it seems, with this bridge. I had a chance to visit this bridge during my tour of the region in 2010 and was quite impressed with its history and appearance. The bridge is a cantilever truss bridge using a Pratt design, and it was built using pinned connections, meaning the parts are put together via bolts and eyelets. The bridge features Howe lattice portal and strut bracings and finials on each of the four cantilever towers of the bridge, all shaped in a form of a curved pyramid. The bridge’s east approach spans the Ohio River Boulevard and a couple abandoned rail lines before making its was across the Ohio River. After reaching the bank, the two Warren pony truss spans crosses the Norfolk Southern Railway before the road terminates at Constitution Boulevard on the west end of the river. Its aqua green color gives the bridge an impressive look, and the people of Ambridge have used the bridge as part of their marketing strategy to bring more people and business to the community of 7,800 inhabitants. Interesting enough, Ambridge was incorporated by the American Bridge Company in 1905, by converging neighboring Legionville with the remnants of the village of Economy, which was founded in 1824 by the Harmony Society. The bridge building company was located here and was the main anchor of business in the city as steel mills drew in thousands of residents, looking for work and a place to start their lives. By 1940, the population had reached 18,968 before the steel mills shut down and many people left the community. While the steel mills no longer exist, the city has preserved much of its business district and is now a main source of tourism. There is hope that the bridge will become part of that heritage once the rehabilitation work is completed. I spent over an hour at the bridge and saw some bridge inspectors there, looking at the state of the bridge and making some notes and perhaps some recommendations. Judging by the appearance of the bridge, it was on the borderline between saving it and scrapping it. As draconian as PennDOT has been to the historic bridges, I would not have been surprised had the decision for the latter choice been taken. But much to my surprise after talking with the inspectors, my assumptions were wrong. From their point of view, it would be possible if the bridge would last another 25-30 years if some repairs are made. It was a rather optimistic prediction given the sorry state of the bridges in the US in general. As a whole, America’s bridges were graded C on a scale from A (excellent) to F (fail) by the American Society of Civil Engineers in 2009. That means that despite progress in repairing/ rehabilitating as well as replacing bridges deemed structurally obsolete to today’s standards, there is still more work to be done. Yet in terms of preserving historic bridges in general, my grade would be in the D range, and in the case of Pennsylvania, a walloping F. That means that historic bridges most of the time are minimally maintained, causing them to deteriorate to a point where replacement is warranted. And that could be expensive, as a new bridge is four times as expensive as updating the bridge to meet current traffic standards. There were many examples of historic bridges I visited in western Pennsylvania that fell victim to neglect because of incremental ways to save money for maintenance- even for a good coat of paint if it is needed. As of this entry, a couple have since been removed and replaced and a few more are slated to come out soon. Despite its top three ranking for the worst infrastructure in the country, Pennsylvania has been trying to catch up on bridge work through its massive bridge replacement program, regardless of where the funding comes from- from the state, federal government or even the private sector. Yet given the dire straits of the US economy and the political stalemate that has been going on in Washington- especially in light of this year’s presidential elections, it seems that the funding is being dried up faster than there are plans for replacing bridges in the next five years. Henceforth, the only viable option for PennDOT is to heed to the demands of the experts in bridge rehabilitation and preservation, listen to the public and rehabilitate the bridge from top to bottom so that the structure can continue serving traffic for more than 30 years and still be part of the legacy that Ambridge still prides itself in. The plan calls for a complete closure of the bridge between now and the end of November of this year and will include the repair and partial replacement of the bridge deck, replacement of the sidewalk and railings, repairs on the steel superstructure, new roadway, and a new paint job, just to name a few features of the project. What will produce a mixture of reactions from the public and those interested in the bridge is the change in paint color from aqua green to grey. While grey is commonly used on many truss bridges, it is highly questionable on this bridge, given its conformity to the surroundings. Yet there are some bright sides to the use of grey on the bridge, which includes it being brighter for cars at night and more noticeable for navigation on the Ohio River. What the bridge will look like once the rehabilitation is completed remains to be seen, but it appears that if the rehabilitation project is successful, it could spell a chance for PennDOT to look for ways to rehabilitate other historic bridges in the area. It does not necessarily have to be the main links, like the Ambridge-Woodlawn Bridge. It could also be some historic bridges, like the Carlton Bridge in Mercer County, which only takes an average of 10 vehicles a day. Rehabilitation can be a win-win situation for all parties involved. 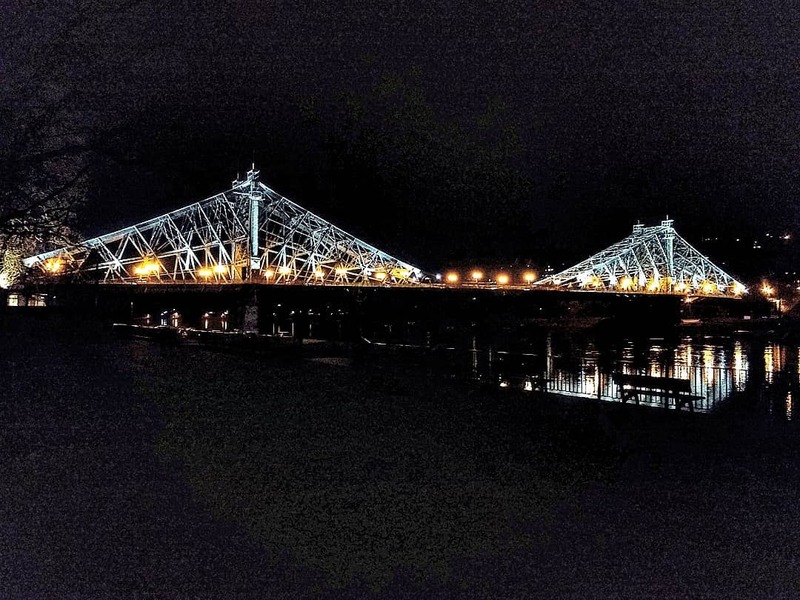 It saves money, prolongs the bridge’s life and maximizes its usage and especially, it preserves the historic significance of the bridge and its affiliation with the community and the people connected with it. The Ambridge-Woodlawn Bridge may help PennDOT to finally turn the curve in terms of its stance on historic bridges. Minus the greater Pittsburgh and Wheeling areas, Beaver County ranks in the top five of the highest number of truss bridges in western Pennsylvania, as many simple and cantilever truss bridges can be found within a 5-6 kilometer radius of each other on average. One of the reasons for this is the policy of rehabilitating and preserving pre-1965 spans with a potential of being reused again, despite the historic significance. A couple noteworthy examples include the Fallston Bridge (below). Built by the Penn Bridge Company in 1884, this two-span Whipple truss bridge was rehabilitated in 2005 and still serves traffic to this day. The bridge is located over the Beaver River near the Beaver Valley Golf Course in Fallston. The other example is the rehabilitation going on at the Beaver Expressway Bridge (middle bridge in the photo below). Built in 1963, the bridge serves freeway traffic and was undergoing extensive rehabilitation of the deck truss span during the visit. The cities of Rochester and Beaver had already renovated a neighboring bridge to the north of the structure.